This was originally reported by NewsBusters on March 25, 2008. In the "Better Late Than Never" category, CBS News has finally reported a misstatement by Democrat presidential candidate Hillary Clinton my colleague Rich Noyes exposed last Tuesday. In a speech on Iraq policy delivered Monday at George Washington University, Democratic presidential candidate Hillary Clinton recalled facing “sniper fire” on her 1996 trip to Bosnia to visit U.S. troops on a peacekeeping mission. But reporters traveling with the then-First Lady made no reference to any “sniper fire” at the time, and pictures of Clinton arriving at the main air base in Tuzla (see attached video) don’t show anyone ducking or covering. Now to the presidential campaign. Hillary Clinton has long been touting her experience, but questions are being raised now about whether she's done some embellishing of her record. Here's investigative correspondent Sharyl Attkisson. It was supposed to be an example of Hillary Clinton's battle-tested experience. ATTKISSON: In the speech last week, Senator Clinton was referring to her visit to Tuzla, Bosnia, in 1996 as first lady. The brutal war was over, but hostilities continued, and though the trip was exactly 12 years ago tomorrow, the memories seemed etched in Clinton's mind. Sen. CLINTON: There was supposed to be some kind of a greeting ceremony at the airport, but instead we just ran with our heads down to get into the vehicles to get to our base. ATTKISSON: Problem is, that's not what happened. And we should know. CBS News accompanied the first lady and daughter Chelsea on that Bosnia trip. That's Senator Clinton talking to me on the military flight into Tuzla, and these are the pictures we recorded of the greeting ceremony when the plane landed. Compare that to Senator Clinton's account. Sen. CLINTON: I remember landing under sniper fire. There was no greeting ceremony, and we basically were told to run to our cars. Now, that is what happened. (From file footage) Thank you! ATTKISSON: There was no sniper either when Senator Clinton visited two Army outposts, where she posed for photos, and no sniper fire back at the base where she sang at a USO show starring Sinbad and Sheryl Crow. 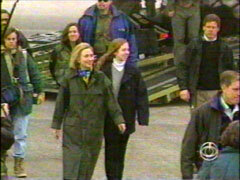 ATTKISSON: Referring to the CBS News video, Clinton aides today acknowledged her arrival in Bosnia was not quite as dramatic as Clinton put it. Ms. LISSA MUSCATINE (Clinton Campaign Aide): She meant that there was fire in the hillside around the area when we landed, which was the case. Mr. MIKE ALLEN (Politico.com): Who knows if she misremembered, misspoke, exaggerated, whatever. It makes the case for Senator Obama that all this experience that she's been talking about is at least partly her imagination. ATTKISSON: Hundreds of thousands have viewed the video online in just the past few days, a reminder that, in politics, memories should always match the videotape. Sharyl Attkisson, CBS News, Washington. Nice report, CBS. Only took you six days.